I’m so incredibly grateful to Christian Connection for making it possible to meet the love of my life. After 9 years as a single Mum it occurred to me that maybe I was looking in all the wrong places for the man I needed. After time in prayer the Lord prompted me to register with a Christian dating website. I wasn’t sure that there was any that existed…. however, good ole google sorted that out. Anyhow, I did register but didn’t bother spending a great deal of time looking or chatting on the website. I was quite distracted with my work situation at the time. After a couple of weeks I was sent a ‘wave’ from a gorgeous guy with broad shoulders who had 2 beautiful little girls. I happily responded, and I’m pleased to say this was the beginning of our beautiful friendship. Two months later after chatting regularly and messaging on a regular basis I finally allowed myself the chance to meet Matthew. After a few days away on a cruise with some girlfriends I stepped off the ship to have my first date with gorgeous Matthew. I was instantly smitten from the time I met him in person! Fast forward 2 years and today we are married, have bought a house and a dog and successfully and happily blended our families. I can honestly say that my God has answered my most heartfelt prayer with Matthew. I honestly never thought I’d meet someone so wonderful…..let along marry him. A big thanks to Christian Connection for making our dreams come true. I am today a very happy new Bride. Firstly, if it wasn’t for Christian Connection we would not have met - this is an absolute understatement. We both set out on our individual journey to hopefully find our respective soulmate...we did alright! From seeing my now bride on your website in August 2016 to the reality of our God’s plan in July 2018, for our lives really can’t be truly put to paper. Kylie-Ann is a breath of fresh air and has been since day one meeting her on your website. 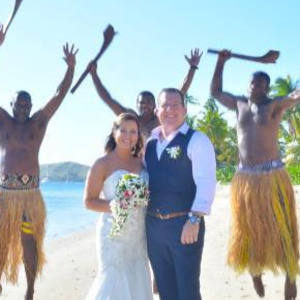 In pursuit of the ‘Great Love’ I was blessed with Kylie-Ann being my bride in paradise in Fiji. I have the rest of my life with this precious jewel from God...being thankful towards my God, is an understatement regarding my soulmate Kylie-Ann.